Topics: Cars For Sale, Faq's, Recent Arrivals, Free Website, and Weebly. Weebly Inc. California is the location of the Apache server. There are 3 Nameservers, ns3.discountdomains.co.nz, ns1.discountdomains.co.nz, and ns2.discountdomains.co.nz. 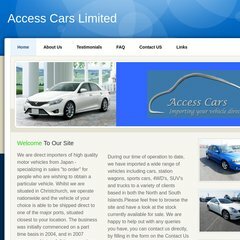 Accesscars.co.nz's IP address is 199.34.228.100. A time of 40.9 ms, is recorded in a ping test.